I've reviewed quite a few prepper books lately, but I've got one more that I seriously have to share with you - Prepper's Survival Navigation: Find Your Way with Map and Compass as Well as Stars, Mountains, Rivers and Other Wilderness Signs by Walter Glen Martin. Dan grabbed this book as soon as I got it, so I've had to wait my turn to read it. When Dan was in the Air Force his map and compass training was something he really enjoyed, so he was very interested in this book. Comparing it to his military training, he pronounced it excellent! The author starts by discussing the need to be prepared and why land navigation is an important survival skill. Most of us are so used to Google Maps and GPS that if we had no electronic devices to tell us how to get someplace, we would be lost indeed. But what if you have to take off cross country, with no roads or other drivers' landmarks to guide you? Or if you got lost on a backpacking or camping trip - would you know what to do? For the completely unprepared, chapter one will teach you how to find north without a compass. For those who want to be a little more prepared, chapters two and three discuss the topographical map and the compass and how to use them. You'll learn how to calculate the measurement of a curved path, adjust for declination, and orient a map. Dead reckoning is calculating your current position by using a previously determining location and using time and speed. You'll learn that too. Also how to use the terrain to find your place on the map. The remaining chapters deal with getting lost, finding shelter, how to prevent and treat exposure, obtaining water, fire craft, and survival medicine. In the epilogue you are challenged to practice the skills taught in this book by starting your own adventure! 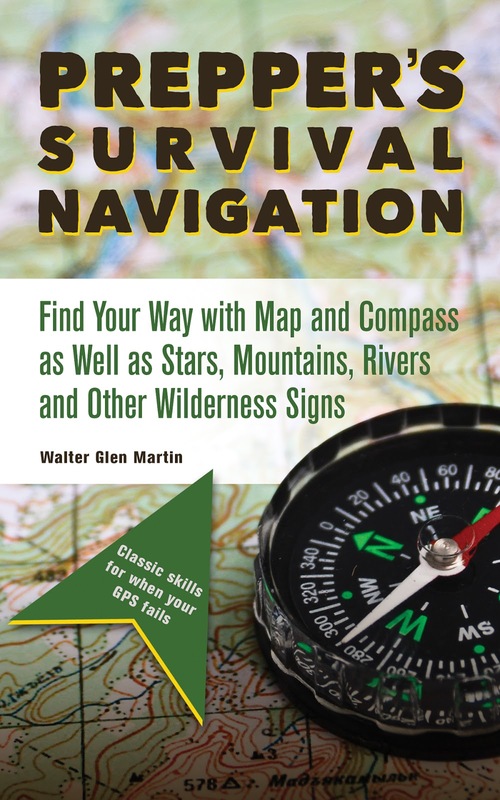 Prepper's Survival Navigation is part of the Ulysses Press prepper series. It's very reasonably priced and available in both paperback (recommended!) and Kindle editions. You can read more about it at Ulysses Press, or buy it now on Amazon. I think it's incredible how sailors used to know where they were according to the stars. And how maps were made by people who were trekking the land. *smile* I like using maps when we go places and just watching the stars come out at night. It's so peaceful. *smile* Thank you for sharing this with us. Sincerely, Mommy of two growing blessings & so much more! I know! Those navigation skills are truly amazing. I have to say that reading this book got me kinda exciting about learning them. When I was still doing a lot of exploring here in the mountains in the 1980's and 1990's, I always used a topographic map and a compass to navigate. Learned the skills in the Marine Corps. When hand held GPS came out, I carried one but it was never my primary method. I trust a map and a compass a lot more than anything electronic. Harry, I agree with you. Electronics are interesting and wonderful, but the definitely need backups. I agree with you Rain. The author of the book cites some pretty sobering facts about getting lost. One is the number of folks that get lost - in the state of Oregon there were 4,244 search and rescue missions over a 6 year period. That's just in one state! The other sobering fact was that after 51 hours, the chances of finding them alive was only 1%. People can survive 3 to 5 days without water and up to 3 weeks without food, so it makes you wonder why they die after only two days. Exposure? Panic? Hopelessness? Defeat? I don't do much hiking or backpacking any more, but I think these skill are important for everyone to learn.